Crowea ‘Poorinda Ecstasy’ is a hybrid whose parents are thought to be Crowea saligna and a form of Crowea exalata. The former parent may have been a form of C. saligna from the Central Coast of New South Wales. The latter parent comes from northern Victoria. The hybrid was developed and registered by Leo Hodge. Leo is best known for the development of many Poorinda Grevillea. Regardless of its uncertain parentage this is a beautiful small shrub that is one metre tall with a similar width. The four centimetre long obovate leaves are light green and aromatic. 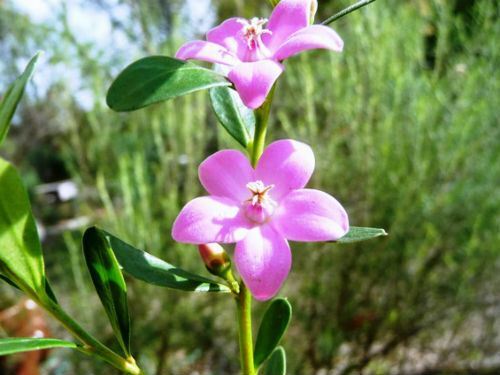 The flowers are pink, nearly three centimetres wide and carried in leaf axils. The main flowering period extends from early summer to autumn. Sporadic flowering often occurs at other times. Crowea ‘Poorinda Ecstasy’ is an outstanding shrub with eye-catching blooms. This hybrid, in common with other Croweas, is very hardy and would be a colourful addition to rockeries and native cottage gardens.